Summer Fun or Sordid Tale? I have just a few weeks until my oldest daughter leaves for college. As a result of that, I’ve thought about little things we can do on the weekends that can get us all out together. I have great ideas. It’s just that the outside influences of the world around us seem to make the best laid plans just fall to hell without my actually being able to do anything. Take, for example, this last weekend. 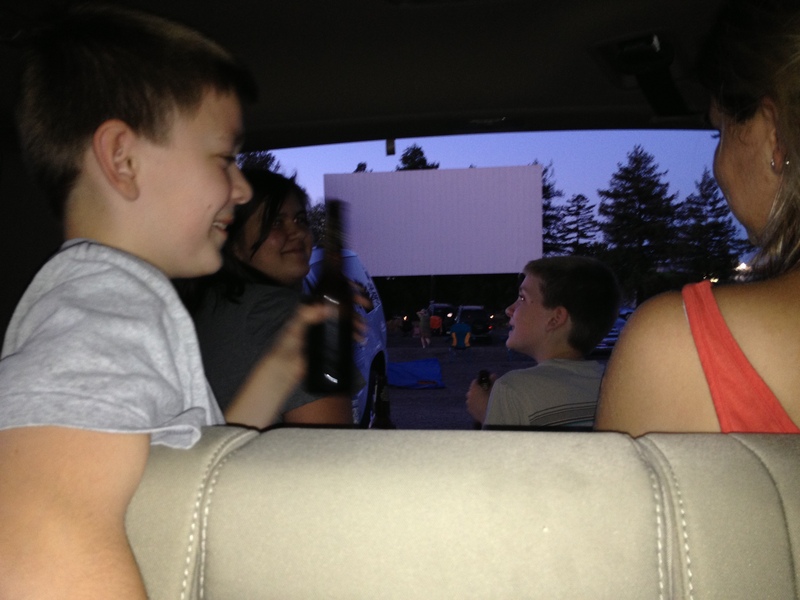 In an effort to be slightly nostalgic, but more than that, to have an “event” of going out, having an experience, fun in the Summer, like I had as a kid, we went to the drive-in theater. That’s right, the bastion of the old 1950’s era, now moved to digital projection with FM radios replacing the clunky old cast-iron speakers that hung from the window. Oh. . . if only the old days of analog with a film projector were still around. We got there when the theater said to arrive: 2 hours early. So 6:45, we’re in line to get tickets. I’d stopped at the grocery store, gotten a whole 6-pack of root beer, some bottles of Coke (see…lots of nostalgia) and put those in an ice-chest. We had Milk Duds, licorice, Skittles, Sour Patch Kids . . . name the movie candy we had it. We’d driven to the screen (there were 6 at this particular throwback to the 20th Century) and parked. We had a great spot. Then, Abbi gets attacked by fire ants. Yep…I thought we’d left them behind in Texas. We really did . . . it’s just they must have hitched a ride on somebody’s car because here she was, swarmed on her sandal-laden foot, with dozens of ants, all stinging her. That should have been our first indication. Then the manager comes over and says “we put you guys in the wrong place, we’re showing The Wolverine over at screen 6.” So we move, get into position, less perfect than what we’d hoped, but still okay. A bottle of water and icing Abbi’s foot we’re seemingly okay. She’s grumpy, angry, and rightfully sore. Still…here we were, waiting to see the movie, the radio on, pop in-hand and then I go get a giant tub of popcorn. Then night comes, finally, right around 8:30pm, and the trailers start. They’re not what I’d have expected for a PG-13 movie. A Mark Wahlberg movie about Afghanistan with a bunch of cursing and shooting in it. A risque trailer that features a bunch of scantily clad women. Then the movie distributor’s logo comes up and we are set and sitting . . . when Mark Wahlberg (why is he in everything all of a sudden?) and Denzel Washington hit the screen. I look over at the screen that we’d originally been parked at and see the Marvel logo flipping by and realize…they moved all the customers but never moved the film. We’re seeing the wrong movie. The theater erupts in honks and shouts. The crowd is less than pleasant nor are they enthusiastic. More than that . . . nobody tells us what’s going on. Now…I have no idea if the West Wind Drive-In in Rancho Cordova, CA, has any idea how to do this . . . but the debacle continued when they continued to take tickets from a mile-long line of cars trying to get into the theater while a line of probably 50 people stretched back trying to get refunds for a film they never saw. The refund line…at the same ticket booth taking tickets to get in to the theater. By the time I’d gotten to the refund booth I had nothing more to add. I got my money gotten in the car . . . and three other movies had finished showing. I was trying to get out of a lot filled with hundreds of cars with the people who actually did see their movie. On the way out I notice…the movie starts on the screen we’d just left. The next day I decided to do it right . 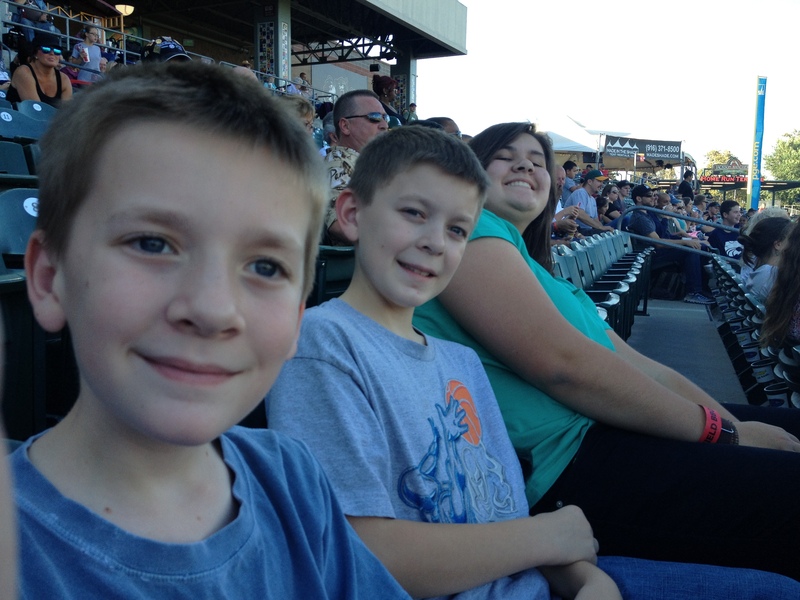 . . my work had given us all tickets for the Sacrament River Cats baseball game. Abbi, I think worried it would be another messed-up Dad plan stayed home with a headache. I took the other three and went anyway. This time we got BBQ, free bobble-heads, and drinks. We got Dippin’ Dots and watched the Cats win their game, staying through the top of the 9th when we knew there was no likelihood that Round Rock would come from behind. Hannah, my middle daughter, put it best about our weekend. I mentioned that the game was far better than the movies.